7121 179xWwR 5 Pfg. Heuss, smooth gum, coil stamp with black counting number \"800\", fresh colors, outstanding perforated, in perfect condition mint never hinged, expertized Schmidl BPP. Michel 600,- €. 7122 263xwR 70 Pfg. Heuss II, smooth gum, strip of eleven with counting numbers odd / straight / odd, unfolded and in perfect condition mint never hinged the odd counting number is four-digit. Michel 240,- €. 7123 263xwR 70 Pfg. Heuss II, smooth gum, strip of eleven with counting numbers odd / straight / odd, unfolded and in perfect condition mint never hinged the odd counting number is four-digit. Michel 220,- €. 7124 357yR 60 Pfg. Important German, two strip of eleven with counting numbers straight / odd / straight respectively odd / straight / odd, unfolded and in perfect condition mint never hinged Michel 200,- €. 7090 W1/3,S1/4 Posthorn, se-tenants W1-3 and S1-4, in perfect condition mint never hinged Michel 430,- €. 7091 WZ1/3 Posthorn, three horizontal gutter se-tenants, unfolded, in perfect condition mint never hinged, without any signs. Michel 360,- €. 7092 WZ1/3 Posthorn, three horizontal se-tenants with gutters, unfolded and in perfect condition mint never hinged, without any signs. Michel 360,- €. 7093 ⊙ WZ3 Posthorn, 4 Pfg. 4 Pfg. Z20 Pfg., horizontal se-tenant, neat cancelled \"cathedral\", expertized Schlegel BPP. Michel 300,- €. 7094 WZ4 Posthorn, 6 Pfg. ZX10 Pfg., horizontal se-tenant, unfolded, fresh colors and very well perforated, in perfect condition mint never hinged, photo expertize \"the condition is perfect\" Schlegel BPP. 7095 ⊙ WZ4 Posthorn, 6 Pfg. 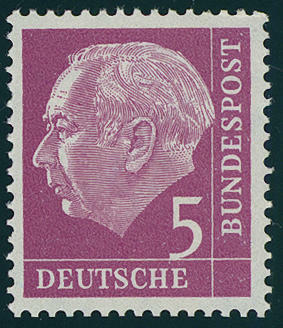 ZX10 Pfg., horizontal se-tenant, neat cancelled \"BERLIN 27.1.53. \", expertized Schlegel BPP. Michel 650,- €. 7096 WZ4HAN Posthorn, 6 Pfg. ZX10 Pfg., horizontal se-tenant from lower margin with rare house order number \"16006.51 2\", fresh colors and in perfect condition unused. 7097 W4/S36 Heuss 1955, all 32 se-tenants complete, in perfect condition mint never hinged Michel 1360,- €. 7098 W4/S36 Heuss 1955, the eight horizontal and 24 vertical se-tenant complete, in perfect condition mint never hinged Michel 1360,- €. 7099 W17/S52Y2 Heuss watermark sideways, all kinds of se-tenants the first and reprinted edition complete without S49 YI and S51 YI, in perfect condition mint never hinged Michel 1750,- €. 7100 W17/S52YII Heuss watermark sideways, reprinted edition, all 15 se-tenants complete, unfolded, fresh colors and in perfect condition mint never hinged, photo expertize \"the quality is perfect\" Andrew Schlegel BPP. Michel 700,- €. 7101 ∆ W30/SZ2b Olympic games 1972, all 14 se-tenants including the gutters, in perfect condition on letter pieces, perfect used \"WETZLAR\". 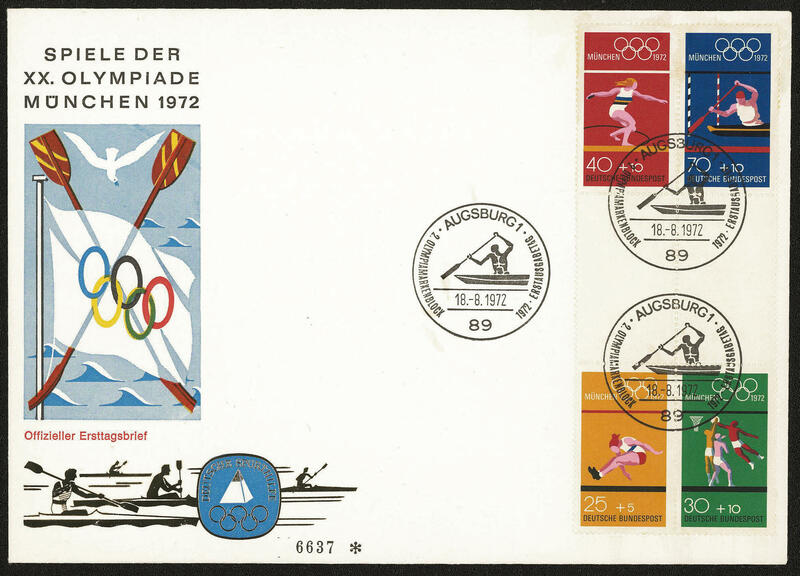 7102 FDC W30/SZ2b Olympic games 1972, all 14 se-tenants complete including the gutters and the stamp booklet pane on 14 faultless illustrated First Day Cover. Michel 746,- €. 7077 S1,3/4 Posthorn, three vertical se-tenants, in perfect condition mint never hinged, without any signs. Michel 195,- €. 7078 S1/4 Posthorn, 4 and 6 Pfg., all fours vertical se-tenants, unfolded, in perfect condition mint never hinged Michel 265,- . 7079 S1/4 Posthorn, four vertical se-tenants, unfolded, in perfect condition mint never hinged, without any signs. Michel 265,- €.